Hamper of 1 Kg. 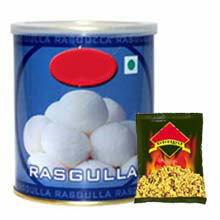 Rasgulla with 200 Gms. Bhujia, 4 Free Rakhi, Message Card.Delivery Time:- 3-4 Days.